The Museu Nacional d'Art de Catalunya bestrides Montjuïc. The Museu Nacional d'Art de Catalunya, with its commanding perch on Montjuïc, Barcelona's dominant hill, is more than a mere art museum. Translated as the National Art Museum of Catalonia, it holds a world-class collection of works by Catalan artists, from 12th century medieval frescoes to modern giants such as Salvador Dalí and Pablo Picasso. 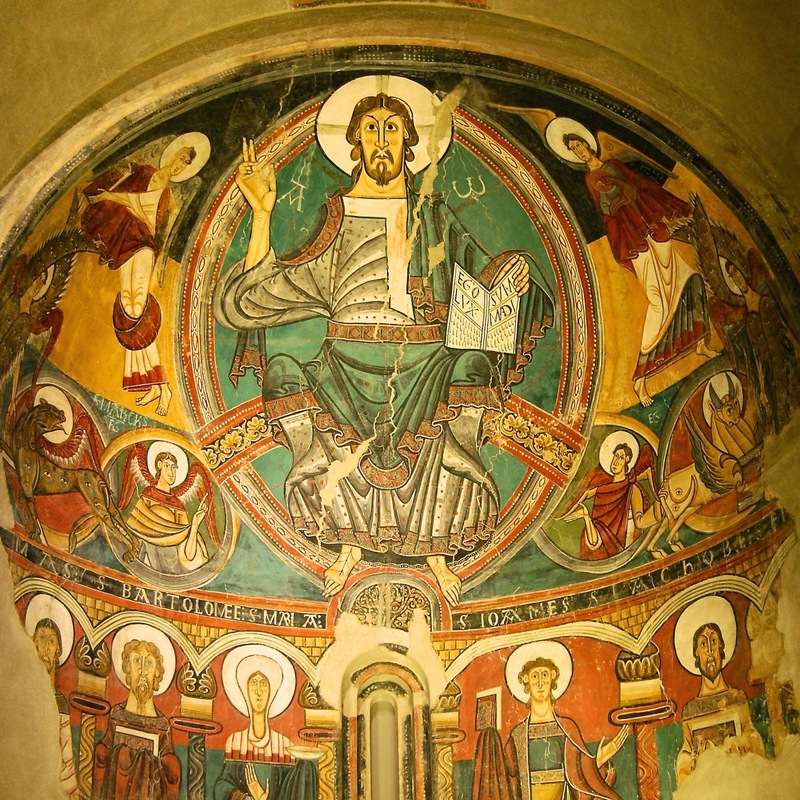 The Apse of Sant Climent de Taüll, an 1100s Romanesque fresco preserved from a church in Catalonia. But note the "National" part of the title. Catalonia is not a nation, at least not yet. The regional Catalonian government, however, declared the MNAC to be a national museum back in 1990, and the museum's official (re)inauguration in 2004 confirmed that title. 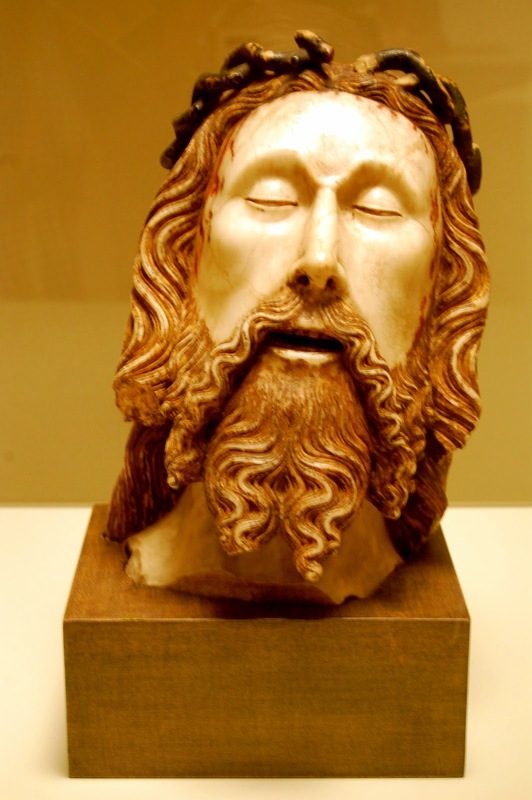 Head of Christ, circa 1352, by Jaume Cascalls. Yesterday, more than two million Catalonians participated in an informal referendum -- a "consultation of citizens" -- asking whether they wanted Catalonia to be a state, and if so, whether they wanted that state to be independent from Spain. Approximately 81% of the voters answered "yes" to both questions. The Spanish government views the referendum as illegitimate. It used court orders to block a more official and binding referendum, calling such efforts "illegal." The national government will not consider an official referendum on independence, rejecting the approach by the U.K. government with regard to Scotland's recent referendum. Closeup scene in The Spanish Wedding, by Marià Fortuny. Nonetheless, Catalonia has grown steadily more assertive regarding its desire for independence. The Catalonians have their own language, called Catalan. They erect monuments to martyrs of the independence movement. Catalonian flags flutter from windows and balconies. 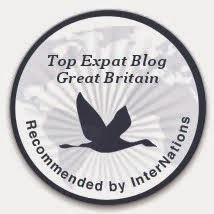 They hold independence rallies attended by more than a million people. And their beloved art is housed in a preemptively-named national museum. In next spring's regional elections, the pro-independence supporters may run candidates supporting a platform with only one item: independence. Victory in those regional elections would, according to the supporters, indicate an undeniable democratic mandate by Catalonians in support of independence. At that point, they argue, the central Spanish government could not deny their legitimacy. Ramon Casas and Pere Romeu on a Tandem, by Ramon Casas, 1897. Is the name of the National Art Museum of Catalonia a passing fancy, or a harbinger of things to come?